After virtually wiping out the youth population of Springwood, evil dream specter, Freddy Kruger (Robert Englund), chases an amnesiac teen (Shon Greenblatt) out of town for an unknown purpose. The kid ends up at a shelter where he falls under the care of Maggie (Lisa Zane). Maggie and John Doe both are plagued by nightmares, so she decides to take them both to Springwood in hopes of shedding some light on their issues. Little does she know her van has some stowaways and even worse, Freddy is waiting for them to uncover the truth. This is the film that throws out all pretensions of being a horror film and instead becomes a slapstick comedy with a little bit of gore. As long as your willing to accept that, it's actually a reasonably amusing film. If you're looking for elements that made the earlier entries work to greater and lesser extents, you're going to be sorely disappointed. 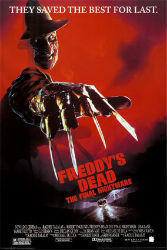 Freddy comes across as a murderous Bugs Bunny, with numerous goofy sight gags including the infamous Power Glove sequence. The central mystery concerns the identity of Freddy's offspring and if falls pretty flat. Even worse, it gives a reason for him to have become a killer in the first place which total robs him of the last bit of mystery he had. The last ten minutes of this film is in 3D, I managed to see it in the theater and it didn't really work then and it's nice to see the DVD retained this final note of disappointment.